Welcoming guests for over 16 years, Sunset Point Oceanfront Villa continues to be one of the most popular, best-reviewed vacation rentals in Providenciales, Turks & Caicos. Providenciales was named the #1 BEACH DESTINATION IN THE WORLD for two years in a row, and in 2015 was voted #1 ISLAND IN THE WORLD! Three of the island's Top 10 Attractions are within walking distance of Sunset Point Villa : Taylor Bay Beach, Sapodilla Bay Beach, and Chalk Sound. Located on the shores of Providenciales, this 4,000 sq/ft vacation rental looks like two houses, but it's all one spacious villa under two roofs. Surrounded by half an acre of lush landscaping and turquoise waters, Sunset Point Villa features four air-conditioned bedroom suites with king or queen beds, five baths, and wide wraparound decks. Compare the price of four oceanfront rooms at a Turks & Caicos resort with the rates for Sunset Point Villa, and you’ll be surprised at how much money you’ll save. Not to mention the space and privacy you'll enjoy! With spectacular, unobstructed ocean views from every room in the house, Sunset Point Villa is aptly named as the perfect place to experience those incredible Caribbean sunsets. The inviting master bedroom suite is located on the upper story of the main house. Open the shutters on the suite's gallery window, and you've got an unrivaled view of the ocean! The adjoining wing of this Turks and Caicos villa rental, connected by covered decks, includes three spacious bedrooms, all with en-suite bathrooms. The over-sized second floor King Palm Suite has a king bed, sleeper sofa, and two queen beds in the open sleeping loft. Enjoy relaxed conversation from Sunset Point Villa's spacious living and dining area, which boasts panoramic ocean views. The living room features a big screen HDTV, stereo-system, and free WIFI. On the ground level leading to the pool deck, the game room includes a big screen HDTV, and full-sized ping pong table. Sunset Point Villa also features a newly remodeled, fully-equipped kitchen with granite counter tops, center island and breakfast bar. For the outdoor chef, there's a Weber BBQ grill with side burner. Use of the tennis courts at close-by Taylor Bay Beach comes complimentary with this vacation villa rental. Or hit the links at Provo Golf and Country Club, Turks and Caicos' championship 18-hole golf course, about a 20 minute drive away. We believe in providing fast, efficient service. If you call or email, we'll get back to you QUICKLY. 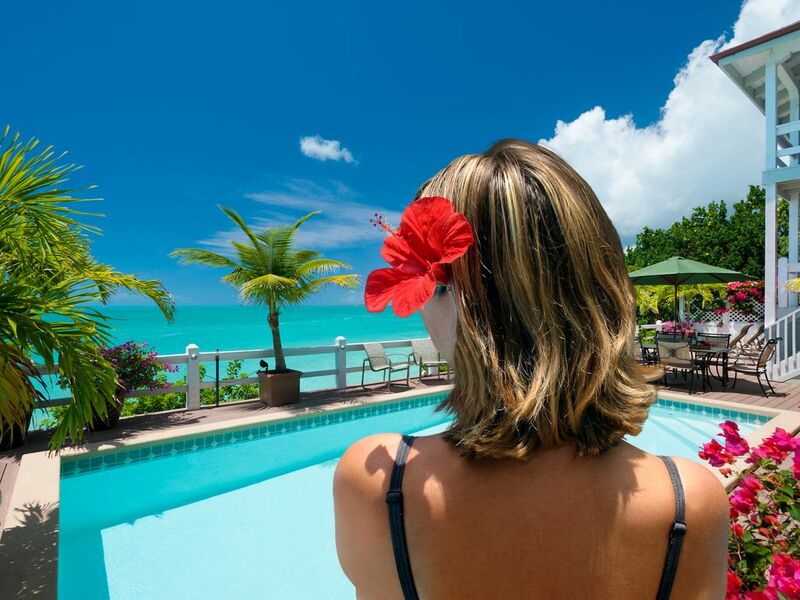 And we're always happy to answer any questions you may have about the villa or about Turks and Caicos in general. Thanks for checking us out. We look forward to hearing from you and welcoming you as our guests! Sunset Point Oceanfront Villa is located at the end of a quiet cul-de-sac, ideally situated to take advantage of those incredible Caribbean sunsets. The ocean off of the dock is shallow and generally calm, perfect for taking a deep or snorkeling. Taylor Bay Beach is just a short 3 minute walk away, and can even be reached by walking in the water if you choose. Every room in the villa has a stunning ocean view. The ocean is shallow and generally calm in back of the villa... perfect for taking a dip or snorkeling. Paradise with all of the amenities! This property is extremely well maintained and has all the comforts of home in paradise. We were a party of 10 and with the layout of the home, we did not feel like we didn't have our own space. You will need a car as one of the benefits of this location is where it's located. Las Brisas is a lovely restaurant near the villa (little pricey) but all other local points of interest are further away. When the tide is low you can walk around to the beach which is tucked away and mainly used by the people in the villas around it. I would highly recommend this villa. Very professional and accommodated all our needs. We'll be back!! We just returned from a weeklong stay at Sunset Point Oceanfront Villa and what a fantastic week it was! We arrived with a party of 8 and the layout was perfect. The layout provides everyone with ample privacy when you want it. I do have a suggestion for anyone booking though. We all have that one-party member who doesn't sleep and is addicted to TV. Put them in the main house bedroom so the rest of you can sleep peacefully in the separate 'yet attached' bedrooms. The kitchen was plenty large enough for us to prepare meals, socialize and enjoy the sunsets from the wall of windows across the back of the house. Although, my favorite place to watch those magical sunsets was from a float in the pool. We took 2 floats with us, only to find about 20 floats under the porch. We took advantage of the option of having some provisions put into the house before our Saturday arrival. After a day of traveling, we didn't want to have to go back out for groceries. We wanted to be able to stay and enjoy the house. Once we arrived, we all agreed the additional cost for that service was well worth it! We only had enough food, snacks, breakfast items and drinks for the first day or two delivered. It was a pleasant surprise to find they took the time to put our groceries away and not just leave them on the counter. They even took the time to stock up the downstairs refrigerator in the game room by the pool for us. Talk about a pleasant surprise to found ice cold beers and bottle water in Both refrigerators waiting on us. Sunday morning, we cooked a big breakfast. It wasn’t until Sunday evening before we hit up the IGA. I highly recommend the IGA grocery store. On our last night, we decided to just have leftovers for dinner. Well that all changed while hanging out at the pool. A few local fishermen came by the house waving. We waved them back to the house dock and bought some of their fresh catch of the day. They were the best warm water lobsters I’ve ever had! This place will always hold a special place in our hearts. We celebrated my husbands’ 50th birthday and our son proposed to his girlfriend by the pool. He wanted to catch her off guard and boy did he!! Now for the owner of the house and his house reps. I had lots of questions and Bob (the owner) responded within an hour or two of my emails. Even responded within minutes on a few occasions. The group he has over seeing the house are just as professional. We had 4 couples and plenty of space. Beds were all super comfy. Convenient to everything. Being able to climb out of the ocean and not be sandy was a huge plus. We will highly recommend this to all of our friends. Thank you for all the little extras too! Only thing to say negative is the slippery tile floors and no bathroom at pool level, but, we survived. My wife, sister, brother in law and I visited Provo last year for my wife's 40th birthday and instantly fell in love with the Island. While we were there we decided to find a home that we could rent with our family for our 10th anniversary in 2018. We did some research and as soon as we found Sunset Point we knew it would be perfect for our party of 8 (6 adults and two kids under five). What we did not know was how perfect is was going to be. The layout of the house is great for a large family or four couples. The bedroom separation enables everyone to have their own space if needed. The house is equipped with everything you would ever need. If this property is available for the dates you are looking for there is no need to look any further. Located on beautiful shores of Providenciales, or 'Provo' for short, this Turks and Caicos rental villa is surrounded by half an acre of lush landscaping and turquoise waters. Available for rental all year round, Sunset Point Villa features four spacious air-conditioned bedroom suites with comfortable king or queen beds, five baths, and wraparound decks on all three levels. Take a cool dip in your own private pool... or step down into the crystal clear ocean just off the pool deck. The water is calm and shallow (about waist-high) in front of this Turks and Caicos villa... perfect for playing, swimming, and snorkeling. And the sugar white sand of secluded Taylor Bay Beach is just a short three minute stroll away! Rates are subject to change without notice. Booked dates must include a Saturday arrival or departure. 20% Tax added on to rate is comprised of 12% Govt. Accommodations Tax and 8% administrative fee Security deposit is not required, however a credit card authority will be taken upon check-in. Cancellation policy - Full refund minus an 8% admin fee from owner if cancelled more than 90 days before arrival. No refunds for holiday bookings (Christmas and New Years). Please read reservation agreement for details.